Bring a large skillet to medium high heat. Pat the salmon dry and season the flesh side of the salmon using 1 teaspoon of sea salt. Add the olive oil to the hot skillet and immediately add the salmon to the pan flesh side down. 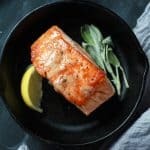 Saute the salmon for 4-5 minutes until browned. Gently flip the salmon to saute on the skin side for another 4-6 minutes. (it may take longer depending on thickness of your salmon. Remove from pan and let sit to cool. In the meantime, bring a small skillet to medium heat. Add butter and 1/4 teaspoon of sea salt to the pan and melt. Once the butter is melted, add the honey, sage, and nutmeg. Stir and let the butter begin to brown, for about 5 minutes. Be sure to stir throughout cooking process so the butter does not burn. Remove from heat.